Casting is really heating up for producer Jordan Peele's upcoming "spiritual sequel" to Bernard Rose's original 1992 adaptation of Clive Barker's Candyman. 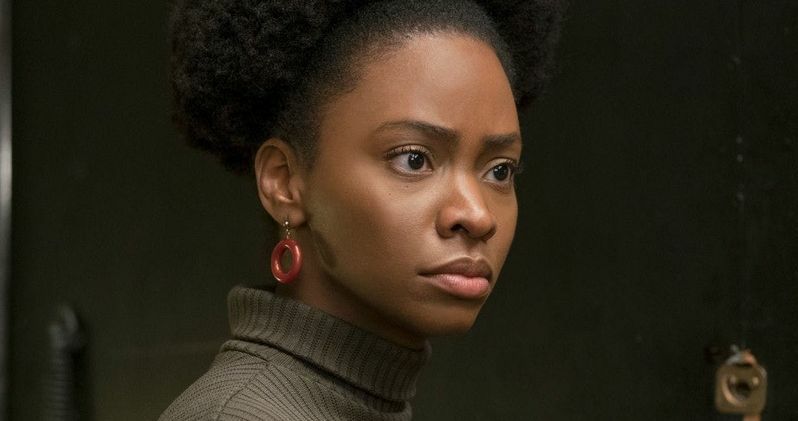 Last week we learned that Aquaman villain Yahya Abdul-Mateen II is in talks for the starring role, and today we have word that the studio and the filmmakers are courting If Beale Street Could Talk actress Teyonah Parris for a supporting role. Teyonah Parris is perhaps best known for her recent role in If Beale Street Could Talk, but the actress has snagged roles in films such as Dear White People and Spike Lee's Chi-Raq. Not to mention roles in TV shows such as Mad Men, where she played Don Draper's secretary Dawn Chambers, Starz sitcom Survivor's Remorse, and Fox's mega-hit series Empire. Parris potentially joing the cast is all well and good, but one of the biggest bits of new info in this story is that it looks like Yahya Abdul-Mateen II is not in talks to play Candyman himself. Instead, he is in negotiations for a role as "an artist who becomes obsessed with the bloody legend." Huh. Wonder how his rumored involvement with the actual title role came about? Anyhow, if Parris does indeed sign on for a role in this new take, she is set to play Abdul-Mateen's art dealer girlfriend. Now all I can wonder is whether or not the rumors of Get Out and Death Note star Lakeith Stanfield playing the titular Candyman are true... if so count me a happy genre fan as Stanfield is one of my favorite up-and-coming actors out there. I guess we'll see about all of this sooner rather than later as Jordan Peele's reboot of Clive Barker's Candyman is heading into a late spring / early summer shoot with Universal distributing the film domestically. Candyman is all set to bring sweets to the sweet in June 2020. The original 1992 movie followed this synopsis. A month or so ago, Peele's upcoming reboot snagged a director in the form of Little Woods writer-director Nia DaCosta. This "spiritual sequel" to Bernard Rose's original 1992 adaptation of Clive Barker's short story The Forbidden will return to the neighborhood where the legend began: The now-gentrified section of Chicago where the Cabrini-Green housing projects once stood. DaCosta's new take on Barker's classic story is all set to hook you in the back of the face come June 12, 2020. This story comes to us via The Hollywood Reporter.